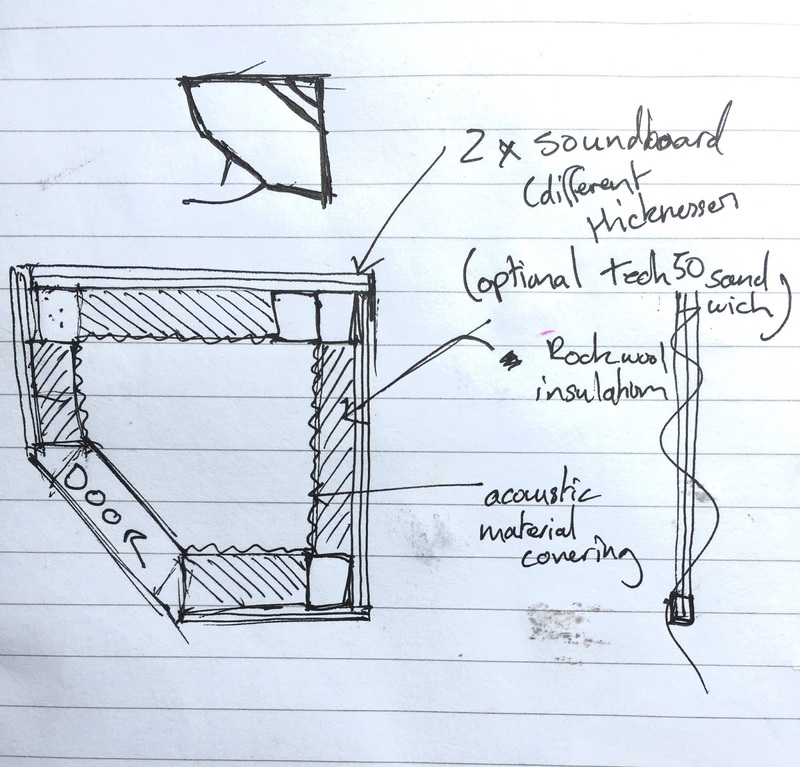 When we moved into our new home in July 2016 with a baby very much on the way, the number one priority on my list was to build a bespoke vocal booth. 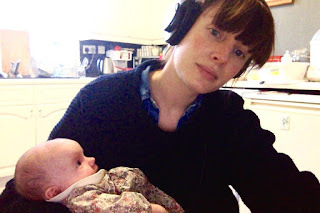 Coming from a more unconventional living arrangement in London, my composer partner and I had become used to sharing a house and a studio - living, sleeping and working in one ramshackle space with guitars and brass instruments lining the walls, bartering for studio time, and (me) sleeping begrudgingly with earplugs in. 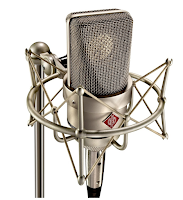 Despite all of that, we recorded all sorts of great quality work there, from our own music, to Ben’s Heineken commercials, pitches for toothpaste ads (I won’t link to that because, literally, it will never leave your soul) to voiceovers of every genre under the sun. It was weird but it worked. Kind of. Then one day, by some witchcraft, we found ourselves the proud owners of a big old house by the sea, where we could not only make a home for our little family, but also build the multidisciplinary studio space of our dreams. Amazing. What could possibly go wrong? Armed with the sum total of a bed, six lamps and a tin opener, we landed in Ramsgate pretty lightly. Having put together a makeshift booth that was perfectly serviceable and ‘would do for now’ the first few months were spent turning the basement into an awesome space for Ben to work, and with just a few weeks of my pregnancy still to go, we were just about to get cracking on my booth when.. The Baby-Bomb landed. A tiny folded-up bird creature, who (and this is the bit that was news to me) just really wasn’t down with me doing much else, apart from hanging out with her. Like, All. The. Time. “We really need to build my vocal boo… no wait I’ve got to go in town for a job, can you just hold the baby a sec…Phew, thanks… so we really need to build my voc… Sorry did you just say you’ve got a job in for tomorrow morning Tokyo time? URGH yep that’s fine but after that can we talk about my voca…” You get the idea. The temporary booth had tricked us - it was too good. At the start of the summer we were recommended some local carpenters (techno timber construction) who were absolute stars, sticking religiously to the design and putting in many more hours than either side had anticipated, to get it right. It's safe to say that his wasn't your average construction project. Thanks to the pesky nature of audio waves, a vocal booth can’t be a square, and the walls can’t be parallel, but built at a minimum of 5 degree discrepancy from one another. The floor is a custom-made base filled with dry sand, and the ceiling had to be angled so it isn’t parallel to the floor. The walls are made of triple layers of soundproofing: A sandwich of 12.5ml sound board and 15ml soundboard, with a layer of tech 50 in between them. All of this is on the outside of the frame to allow space inside for 100ml deep rockwool, and is all covered in sonically transparent fabric. The door is a heavy fire door with a double rubber-sealed rebated frame, and a heavy duty door closer. Finally there are power and audio cables set into the structure. It took weeks of research to design, two very skilled carpenters two days in the workshop to make, and one day to put it together in situ. I never thought I’d have a room of my own to work from, let alone a sound proofed one, but already I find myself extra eager to get in there to record auditions, and so much freer in my work because of the space I have to move around in. It feels very empowering to have created the best conditions possible to work in, and in general I feel excited about our future here. Building the booth has sparked more conversations about what we ultimately want to achieve in this building as a whole, and that includes musical collaborations with local artists - some seeds of which have already been sown. We would like to create a little hive of audio activity, and this feels like the right place to be for that. 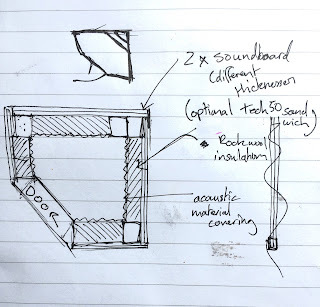 I’ll be writing about the upcoming Ramsgate Festival of Sound in a few weeks, and check out my next blog post to find out about the new hardware we chose for the vocal booth!